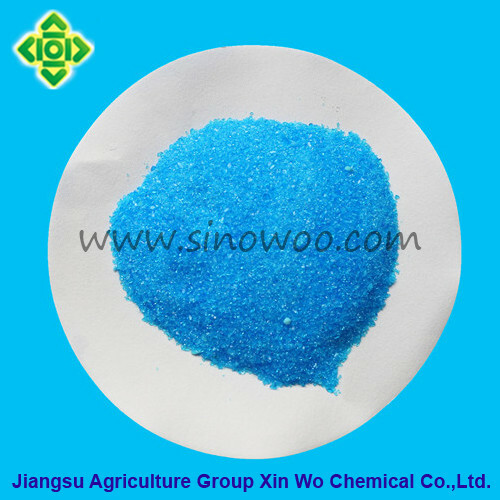 Copper Sulphate Pentahydrate is used as nutritional supplement, antimicrobial agent, firming agent and processing aid in food industry with its CAS NO. 7758-98-7 and formula CuSO4·5H2O. It`s dark blue triclinic crystal or blue crystalline powder or granule. It smells like nasty metal. It effloresces slowly in dry air. Relative density is 2.284. Above 150℃, it loses water and form Anhydrous Copper Sulfate which absorbs water easily. It`s freely soluble in water and aqueous solution is acidic. PH value of 0.1mol/L aqueous solution is 4.17(15℃). It`s freely soluble in glycerol and dilute ethanol but insoluble in pure ethanol. It is used as nutritional supplement, antimicrobial agent, firming agent and processing aid. It is packed with polyethylene bag as inner layer, and a compound plastic woven bag as outer layer. The net weight of each bag is 25kg. transportation, unloaded with care so as to avoid damage. Furthermore, it must be stored separately from poisonous substances. 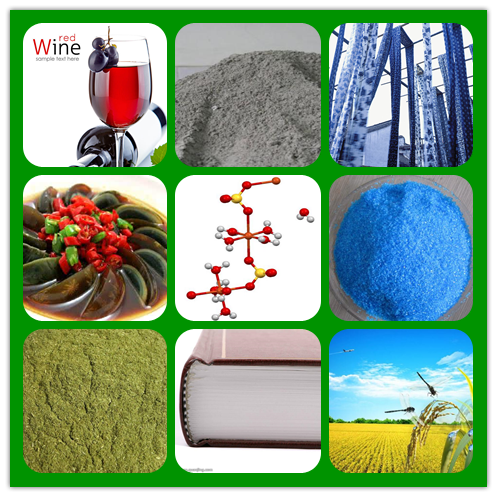 Looking for ideal Copper Sulphate Food Grade Manufacturer & supplier ? We have a wide selection at great prices to help you get creative. All the CuSO4 5H2O are quality guaranteed. We are China Origin Factory of CAS NO 7758-98-7. If you have any question, please feel free to contact us.